CV-140 Video Processor, Olympus CLV-U40 Light Source, Monitor, Cart – 2 AVAILABLE. (3) Olympus mdl. GIF-N180 EVIS EXERA II Gastrointestinal Video Scope. (2) Olympus mdl. GIF-130 Flexible EVIS Video Gastroscope. 2000 OGP Optical Gauging Products “Smartscope Flash” Video Measuring System s/n SVW1106 w/ Joystick Controller, Misc Acces. Unholtz-Dickie mdl. 206H Electrodynamic Shaker w/ Control Panel. Unholtz-Dickie mdl. 56E Electrodynamic Shaker w/ Control Panel. Temptronic ThermoStream mdl. TP-04000A-2B21-1 Temperature Forcing Thermostream System s/n 9402989. Camelot Systems “Cam/Alot” mdl. 1818 CNC Dispensing System s/n 1818-2387 w/ Video Inspection System, Computer, Monitor. MPS mdl. TF100 Integrated Circuit Surface Screen Printers – 2 AVAILABLE. Red Point Corp mdl. ER14115-OS-VP200D/REF Red Point Encapsulator Vacuum Chamber s/n 1402-1663. ESI Electro Scientific Ind. mdl. 44 Laser Trimming Machine w/ ESI Controls. Instron Pull Stress Tester w/ Printer. 1998 Aqueous mdl. AQ-400/SMT Laboratory Dish Washer s/n 6450 w/ Digital Controls. Hughes mdl. 2470-II Automatic Wire Bonder w/ Video Inspection System. Hughes Adaptive Bonding System w/ Video Inspection System. Hughes mdl. 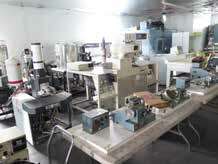 2500 Die Bonder System w/ Video Inspection System. RTC Radiant Technology Corp. mdl. SMD-3015 30.3kW 15” Pass-Thru Furnace s/n 840099. Trio-Tech International “Centrisafe” mdl. G3585-4C Centrifuge Accelerator s/n 1371. Hitachi mdl. S520 and Cambridge mdl. S100 Scanning Electron Microscopes. 2006-2009 Baker Co. mdl. EG-6252 Stainless Steel Laboratory Flow Hoods – 5 AVAILABLE. IAS and Terra Universal Laminar Flow Stations. Baxter mdl. DN-43 Constant Temperature LBb Ovens. CEC Consolidated Electrodynamics Corp. mdl. 24-120A Leak Detector. Thermotron Large Capacity Thermal Test Chamber w/ Control Consoles and Heating/Cooling Units. Sloan mdl. SL-2800 Environmental Vacuum Chamber. T-M Vacuum Products “High Vacuum Equipment” mdl. C4565 Vacuum Chamber. MBA mdl. TC-2 CO2 Infused Lab Ovens – 2 AVAILABLE Thermotron mdl. S-16 Mini-Max Environmental Chamber s/n 11887. Blue-M mdls. CR07-256B/C, POM-3368-1, CR07-146B/C, OV-500C-2, OV-490A-2, POM-336B-1, POM-256C-1 Constant Temperature Ovens. Fisher Isotemp and American Scientific Drying Ovens. Barnstead / Thermolyne mdl. F62735-80 Electric Furnace. Unitek Hand Held Spot Welder w/ mdl. 250 Digital Pulse Stored Energy Power Source. LSI Reflow / Avio mdl. TWC-116 Lead Attachment System. Wenesco mdl. M-107 Desoldering System. Universal “Micafil” mdl. 06-A Auto Winder s/n M113 13” x 18” Cap. Geo Stevens mdls. 39AM, 38AM and 38 Winding Machines. Eubanks mdl. 2600-4 Automatic Wire Stripper / Cutter w/ mdl. 6215 Spool Feed Unit, Straightening Rolls and Blades. Banner Technical Devices mdl. MARK I-C Mark-1 Wave Soldering Machine. Solitec Auto Spreading System w/ Solitec Controls, Timers and Flow Controls. SCP Process Cleaning System w/ 6 Cleaning Tanks, Heaters, Timers. Fluoroware Systems 2-Cycle Wash System. Pexto mdl. PS-66 16GA 6” x 6” Corner Notcher s/n 248-10-78. Hewlett Packard “N-Class” mdl. HP9000-N4000 Rack Mounted Computer System.